A healthy tourism economy is built and supported by Destination Marketing Organizations (DMOs) such as VISIT DENVER, The Convention & Visitors Bureau, that use a portion of the local Lodger's tax and private membership dollars to market Denver as a visitors' destination. Denver visitors stimulate the local economy and benefit hotels, meeting facilities, attractions, restaurants, cultural institutions, tour companies, transportation providers, local farmers and countless other businesses. Denver had a record 17.4 million total overnight visitors in 2017, up 1 percent from 17.3 million in 2016. Overall tourism revenue reached a record $6.5 billion in 2017, a 5-percent increase over 2016, and overnight visitors spent a record $5.6 billion, 6 percent more than 2016. Tourism supports 59,300 (as of 2017) jobs in metro Denver, a 4-percent increase over 2016. Tourism saves every metro Denver household $543.66 annually in taxes (this is the amount of tax dollars residents would have to pay if not for the more than $1.2 billion in state and local taxes paid annually by visitors). Denver visitors spent more than $1.7 billion (up from $1.58 billion in 2016) in Denver hotels and other lodging establishments and more than $1 billion on food and beverages. Expenditures by visitors on transportation topped $1.5 billion. Purchases at retail stores were $688 million, while vacationers and business travelers spent $536 million on paid attractions and other recreational and sightseeing activities. 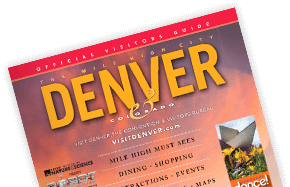 VISIT DENVER focuses its marketing efforts on "marketable visitors," those who respond to marketing messages and have a choice on where they vacation. On average in 2017, the biggest spenders were marketable leisure visitors, who spent $171 per day; followed by business travelers who spent $154 per day. Both figures increased over 2016, and 2017 marked the first time marketable leisure visitors spent more per day than business travelers. An additional 14.3 million day visitors spent $921 million. Business and leisure travelers to Denver are having a positive financial impact locally.